I teach in a university with a very high proportion of non-Anglo-Canadian students. At the University of Toronto Scarborough Campus, the majority of the students in my journalism classes are from families who have come from China, South Asia, Iran, the Middle East, Africa, and the Caribbean. So there is a certain tension when the subject comes around to how journalism should handle "uncomfortable" ideas such as race, sexuality and satire especially when directed toward identifiable groups. When the Charlie Hebdo massacres occurred, we talked about whether media organizations can or should be limited in what they can do. What is the purpose of anti-hate legislation? Should any of the cartoons be republished? And if not, why not? What are the limits, if any, of free speech in a digital culture? The discussion was quite frank. One Pakistani student felt comfortable enough to ask me privately, why the media has so many Jewish employees and employers. He also asked why is it ok for the media to criticize Islam but not the Holocaust? (He knows I'm Jewish). I responded by saying that it's not fair to criticize either. But it is fair to question the violent actions of of both radical Muslims and Jews. I also pointed him to an excellent article by Roger Cohen in the New York Times. If journalism were only comforting, it wouldn't be journalism, I told him. On the other hand, if it only reports the worst aspects of humanity (often the most newsworthy), we would be doing a disservice. Finding that elusive balance is what makes journalism so interesting, so challenging, and so fierce. 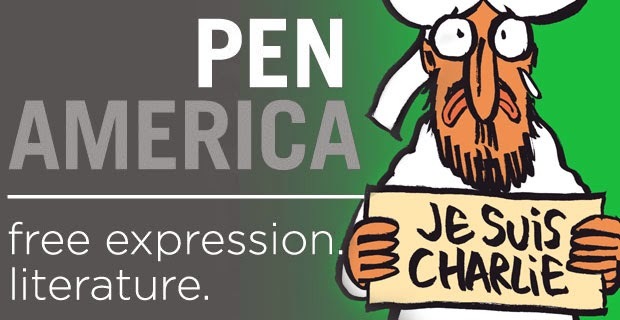 Now the Pen Gala is being challenged for giving an award to Charlie Hebdo for its commitment to free (and offensive) speech. Some serious writers have said they will not attend because of their sense that the cartoons pillory an already oppressed minority. The debate is intense. And appropriate. And it fits in perfectly with the anguish I witnessed in my class where students of colour felt nervous about re-posting the cartoons while white students thought it was a proper journalistic service. Now the CBC is in another internal crisis over how its programs should or should not describe what happened to Armenians a hundred years ago. Was it genocide, as many governments (including the Canadian government) have allowed? Indeed was it the first genocide that paved the way for future genocides of Jews, Hutus, Bosnian Muslims and others? For instance, historians consider the Holocaust an attempted genocide of the Jewish people. Despite the strong views of a few fringe communities, the Holocaust can be considered an attempted genocide without qualification. Nazis murdered six million Jews during the Second World War. By contrast, Turkey has refused to classify the mass killings of Armenians by Ottoman Turks during the First World War as genocide. Turkish authorities consider the deaths a legitimate military response to revolution and banditry. Canada and more than 20 other countries have formally recognized the killings as genocide, including Belgium, France, Italy and Russia. So has a United Nations commission and the European Parliament. Critics, however, have questioned whether the killings between 1915 and 1916 were actually part of an orchestrated, systematic attempt at extermination - a key component in their definition of genocide. Many Armenians were killed. Others died of starvation or disease. Millions of people around the world mark April 24 as the Armenian Genocide Remembrance Day. More than 20 countries, including Canada, recognize the slaughter of Armenians during the First World War as genocide. But Turkey rejects the term. There's no need to use a word such as "alleged" to describe mass killings that are known to have taken place. But when facts are in dispute our audience should be informed. (Armenians say 1.5 million died, for instance, while the Republic of Turkey puts the number at 300,000.) While some governments and many scholars label the killings genocide, it's important to acknowledge that Turkey and others do not. By mentioning both official positions, CBC News maintains balanced coverage. This has outraged a number of CBC journalists who wonder whether this is an attempt to avoid any sort of outside criticism. It would make my Pakistani student wonder about the "courage" of western media. So then: It is “unfair” to criticize Islam and/or Judaism? Across the board?